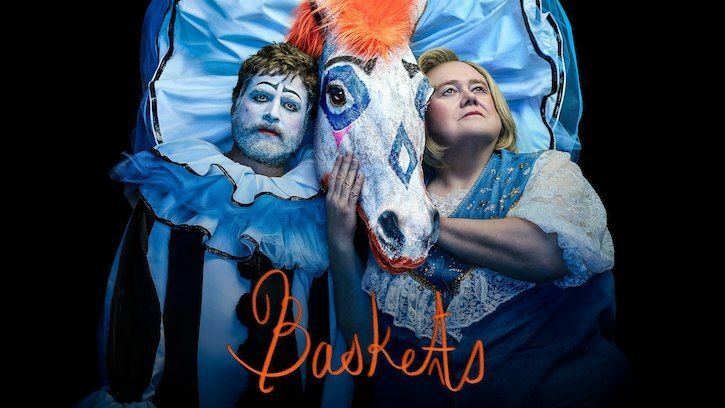 Baskets - A Night At The Opera - Review: "No, Oprah's With Weight Watchers Now"
Season 3, episode 4 was written by Theresa Mulligan Rosenthal and directed by Jonathan Krisel. The one person who is going to get in the way of Christine's success and happiness is...Christine. After feeling slighted again by her snarky, card playing group of girlfriends, Christine decides to throw a big event at the rodeo: a night at the opera under the stars. Eddie has to be told it's opera, not Oprah; easy mistake to make. Ken's even flying in from Denver. And Christine wants to know if opera is sung in Portuguese. She starts out by going way overboard with the new company credit card; fireworks, lobster, flying in French clowns from France , 18 buckets of shrimp from Popeye's, little gifts for her 'VIP' friends, a professional photographer, just to name a few. She's desperately trying to impress her friends. She wants to wow them! Eddie wants a company credit card, too, but Dale says he'd give a card to Linda the goat first. You just know that this is NOT going to end well. Though, the big night arrives and somehow everything starts to fall into place; even with Dale cancelling the most expensive items like the fireworks and the French clowns and questioning the organic wine. You know you're in trouble when Dale is the voice of reason. But, with all of the stress, he hurts his back. He gets some relief when Linda the goat walks on his back. Mama makes Chip work the front of the house because the clown act that he's been working on with sign spinner Sleepy/Sneezy/Sleazy? (whom Christine found on a street corner) is a bit boring. Though Sleepy is very talented and dons the clown attire to sign spin on stage with the tenor. Chip pretends not to know Martha at the entrance: "Martha, last name please!" But she makes him feel even worse by reminding him that front of house is a demotion from head clown. You can always count on Martha to put things into perspective. Chip and Dale have a nice interaction, talking about their Mama and how she became their Cub Scout leader when all of the fathers gave up. I love to see Chip talking so sweetly about her, how she creates disaster, but does it out of love and good intention. The night is beautiful, the opera singer, the flowers, the lighting, the stage, the fancy tables and chairs, Mama's lovely costume with horned, Viking helmet. But when Christine orders more fireworks than the two that Dale agreed to (Dale thinks that 10,000 sparklers would have worked just fine), things start to fall apart. So, maybe now Christine will stop trying to impress people who don't really care about her and spend more time thinking about herself and Ken. Poor Ken who was forgotten about and left at the airport, at the velvet rope store, in the car. He remains kind, caring and supportive, but how long can he continue to play the 'nice guy' all of the time? At the ending, Dale calls in Jim for help to reign in Mama Baskets. Jim went to college, well the DeVry Institute, Christine defends him: "it's accredited, you know." I'm worried. Chip is still apathetic about the rodeo, Christine is going overboard and Dale is the only one making any sense, oh no! Another great episode, of course.